If you thought your fancy new iPod Touch was the pinnacle of all things audio Pioneer might just have something to say about that with the launch of its catchily-titled, XDP-100R. While the branding might not be so hot the audio prowess of this powerful portable Hi-Res Audio (HRA) player most certainly is. The little Hi-Res Audio label on the front of the box means the XDP-100R has got the sonic skills to support the highest resolution music file formats, like DSD and FLAC. The Pioneer player is all about the lossless audio. But that's not all - the XDP-100R is also set to be one of the first players to support the upcoming MQA revolution. Master Quality Authenticated (yup, MQA does sound a lot cooler) is a new file format promising to deliver the full range of Hi-Res Audio packaged down into file sizes not much bigger than we're seeing streamed today from Tidal. It uses a method it's calling Audio Origami to fold the full, lossless, audio file down into a manageable size, with the playback devices using either hardware or software decoders to unfold and playback in all the aural glory. But it's actually far more important than that. Because of the way the MQA files are folded up even if the final device you're using to play them doesn't have a compatible MQA decoder you'll still be able to listen to it. And while it may not come out in the full 24-bit flavour it will still play back in higher quality than CD. This is huge news for the streaming services because it means they'll be able to stream seriously high resolution music without demanding much more bandwidth than their current CD quality offerings. Tthe XDP-100R isn't getting that support straight out of the box, that will come in a full system update early in the new year. And we expect Tidal support for MQA to appear sometime next year too, completing the exciting aural proposition. Right now though the Pioneer HRA player is still an impressive prospect, capable of playing full DSD files on the go for up to 16 hours on a single charge. And with support for a frightening number of formats and sampling rates. And because it really wants you to go ahead and stick some chunky HRA files on the device there's a whole lot of storage on offer too. To start with it comes with a 32GB capacity on board, but with a pair of microSD slots capable of supporting cards up to 200GB in size. That's a potential device capacity of 432GB. With the full Google Play store on offer to this Android Lollipop-powered player though you also get the convenience of streaming from the likes of Tidal and Spotify as well as downloading from Onkyo Music for your Hi-Res Audio needs. 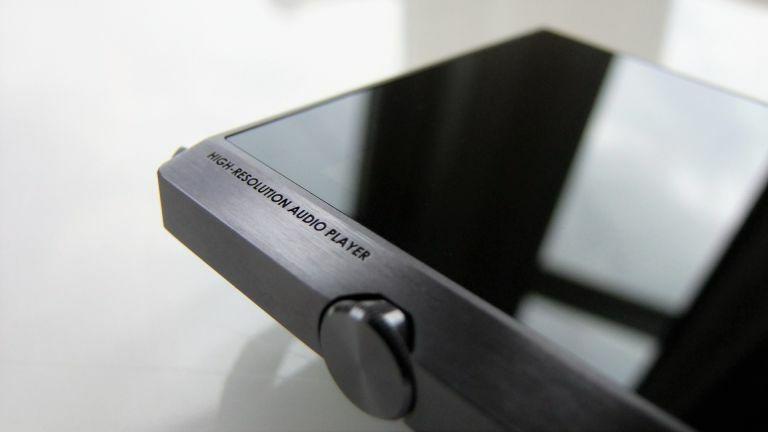 At £500 the Pioneer XDP-100R is a real treat for the audiophile, offering HRA support on the go. And with the likes of the stunning Acoustic Research M2 HRA player coming in at around £900, though with twice the storage, the XDP-100R looks pretty well priced too. We've been playing with the new Pioneer HRA player overnight and it's a great-sounding piece of kit and incredibly easy to use too, look out for the full review very soon.